Redmi was later last year announced to be a separate brand which makes the Xiaomi Redmi Note 7 to be the first in the Note series to carry the new banner. The new smartphone very much looks like the bigger version of the Xiaomi Mi Play. In terms of specs, the smartphone fits perfectly in the mid-range category and has a 48MP rear camera as the highlight. Like the ones before it, the smartphone is priced in a way that gives it quite a good value for your money. The Redmi brand is known to recycle design on its smartphones, in fact, the entire Xiaomi brand is known to do so. In all, the smartphone takes after others before it, with a similar design just different internals which makes it cheaper to make. Nonetheless, the smartphone still looks good maintaining the nice gradient design. There are the bezel reduction all over the screen style and the circular notch at the top of the screen. Going for a fairly large screen, the smartphone does have a decent display on board albeit an LCD type. There is the four curved corners of the screen with a Corning Gorilla Glass 5 for extra protection and durability. 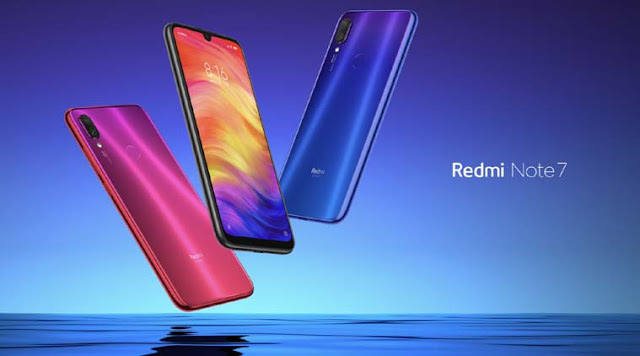 Resolution-wise, the Xiaomi Redmi Note 7 is supplied with 1080 x 2340 pixels on a 6.3-inch sized screen. The past few generations of Redmi Note smartphones have maintained quite the same battery capacity. A faily large 4, 000mAh capacity battery can be spotted on the smartphone which is quite enough for the proprietary till the end of the day timeline. You’ve also got fast charge through the USB Type-C port on the smartphone smoothening the process. For the photography part, the smartphone is spear headed by a 48MP main camera with f/1.8 aperture and a 0.8µm pixel size alongside a 5MP secondary sensor both on the rear side. There are features like portrait mode, EIS, low light shot enhancement and slow-mo videos. Over to the other side, smartphone is equipped with a 13MP front camera. There is an upgrade from the its predecessor for sure me as we have a number of variants. All with a an octa-core Qualcomm Snapdragon 660 chipset and an Adreno 509 GPU as well. However, you’ve got a 3GB RAM version with 32GB ROM, a 4GB RAM model having 64GB of storage space and a 6GB RAM and 64GB internal storage peak model. They all have support for expansion up to 256GB and as well carry Android Pie on them. The smartphone is for sale for about 55, 000 Naira for the 3GB variant while the 6GB model cost 73, 000 Naira depending on the deal and your location.